First, I have to share the present I bought for myself. I bought it in the Modish shop's big closing sale and it arrived in the mail yesterday! Isn't it cute! I can't wait to wear it, I almost did today but I don't really want to wear it to work. 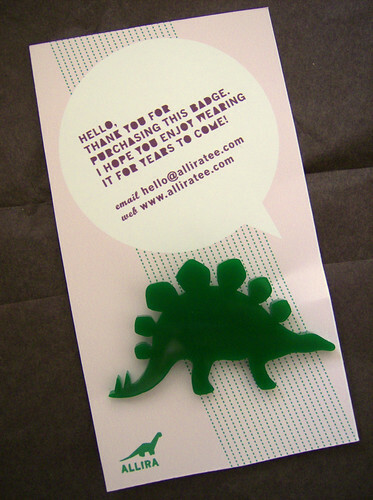 You can get one too, or loads of other really adorable brooches, at the allira.com shop. That's right, dudes, you get to choose! So, just leave a comment on this post, say something nice, and at the end of this patriotic week, I will randomly choose a winner! My birthday is in July too! ^_^ Happy birthday to us! LOL! I saw you post on LJ with Esty community. I want to wish you a very blessed Birthday as well as comment on your amazing talents. I love the little books you make, it takes time and talent to do that. Amazing work! LOVE the spirograh! It takes me back! Happy Birthday! I love Spirograph notebook No. 6! Great broach! I love the Roar one as well. Came over from lj. I took a look around, nice work :) Anyhow, happy Canada Day! Oh, super fun!! I'm all about your color combos! That dino pin is so awesome! I'm totally wearing a dino shirt at work right now...lol. Lovely notebook, too! Oh, I love your notebooks! I've totally seen your work on Etsy and LOOOOVE IT!! Happy early birthday! !